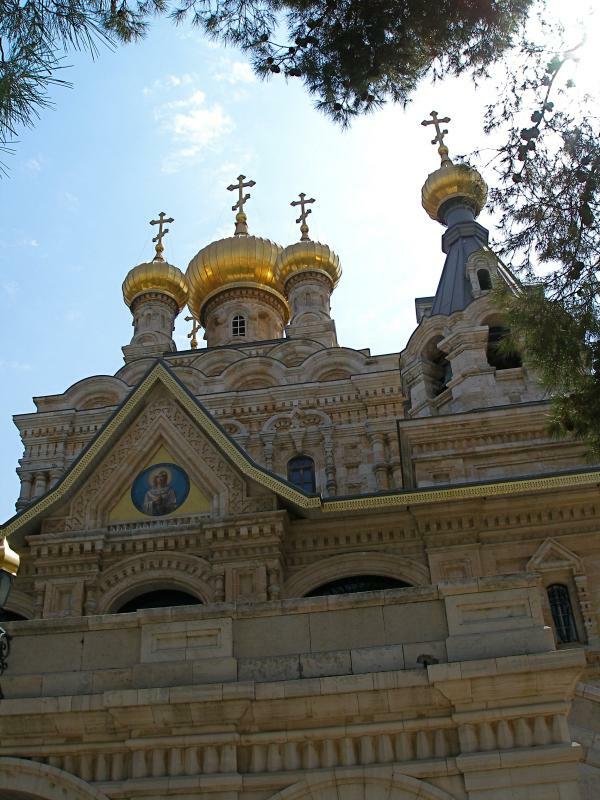 Seven gilded onion domes, each topped by a tall Russian Orthodox cross, make the Church of St Mary Magdalene one of Jerusalem’s most picturesque sights. It makes an especially striking spectacle at night, when its floodlit domes seem to be floating above the dark trees that surround it. The church stands on the western slope of the Mount of Olives, above the Garden of Gethsemane and the Church of All Nations. It commemorates the enigmatic Mary from Magdala — revered as a saint by the Orthodox, Catholic, Anglican and Lutheran churches — who was one of the few persons named in the Gospels as being present at Christ’s crucifixion and who was the first recorded witness of his Resurrection. In its convent live about 30 Russian Orthodox nuns from several different countries. While particularly known for the quality of their liturgical singing, they also paint icons, embroider vestments and items for liturgical use, and decorate Russian eggs. The Church of St Mary Magdalene was built in 1888 by Czar Alexander III of Russia, in memory of his mother, Empress Maria Alexandrovna, whose patron saint was Mary Magdalene. Its onion-shaped domes and the general style reflect the architecture of Moscow during the 16th and 17th centuries. Although the intricately decorated façade appears to be made of marble, it is actually of sculpted white sandstone. 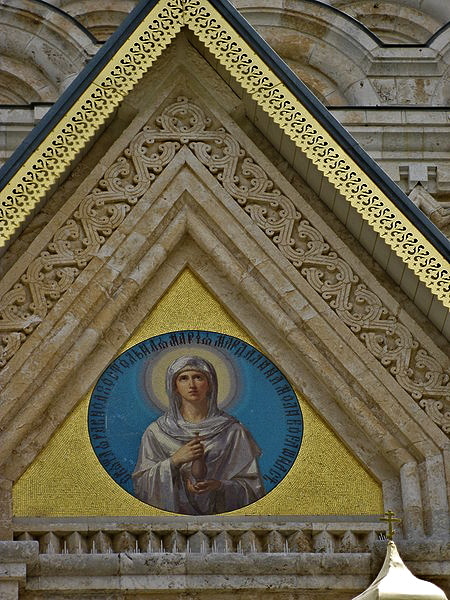 Above the entrance a circular blue mosaic medallion depicts Mary Magdalene robed in white. In contrast to the exterior, the interior of the Church of St Mary Magdalene is rather plain. The walls are covered with designs, predominantly in shades of brown.The white marble and bronze iconostasis — the partition that separates the nave from the sanctuary — holds icons and paintings, including depictions of the four Evangelists, the Virgin Mary and the archangel Gabriel. Above the iconostasis, a large canvas by Russian artist Sergei Ivanov illustrates a popular legend in which Mary Magdalene travels to Rome to tell the Emperor Tiberius of Jesus’ unfair trial and unjust sentence. She is shown presenting the emperor with a red egg, symbolising the Resurrection and eternal life. To the right side of the iconostasis, a 16th-century icon of the Virgin Mary in a hand-carved wooden case has a place of honour. The icon is said to have miraculous powers. 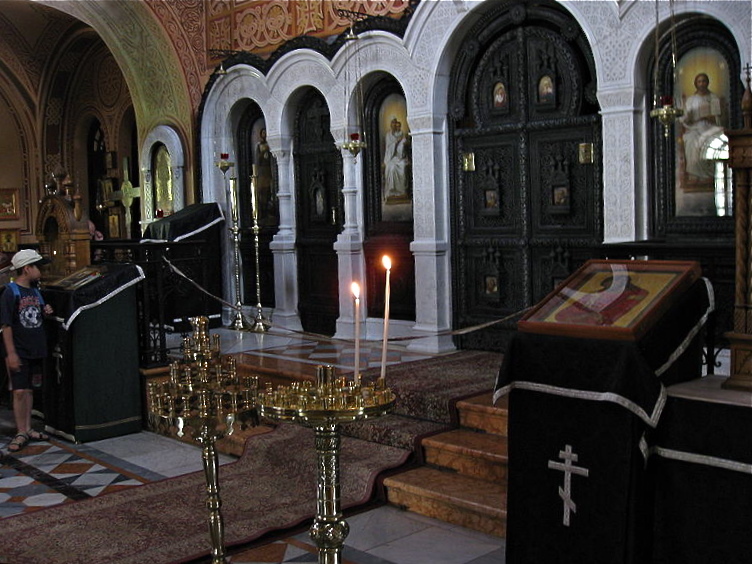 On either side of the nave is a marble sarcophagus, each containing the body of a Russian Orthodox saint. The better known one is Grand Duchess Elizabeth Feodorovna. A German princess, she was the wife of the Czar’s brother Sergei, a sister of the Czar’s wife Alexandra — and a granddaughter of Queen Victoria. The grand duchess took a deep personal interest in the church and was responsible for commissioning its art works. Widowed when an assassin killed her husband in 1905, she founded a convent and became its abbess. She and her nuns did much to help alleviate the suffering of the poor in Moscow. After the Russian Revolution, Grand Duchess Elizabeth, her companion Sister Barbara Yakovleva and other members of the Russian imperial family were thrown down a mine shaft by the Bolsheviks in 1918 and left to die. The bodies of Grand Duchess Elizabeth and Sister Barbara (whose remains are in the other sarcophagus) were eventually smuggled out of Russia and brought to Jerusalem. Both women have been canonised as martyrs by the Russian Orthodox Church. In a crypt below the church is buried Princess Alice of Greece, the mother of Prince Philip, Duke of Edinburgh. She had expressed a wish to be buried near Grand Duchess Elizabeth, who was her aunt.